Puppies don't have teeth at birth. Your puppy's baby teeth start coming in when he's only 3 weeks old, about the time you can start offering him solid food. Formally known as deciduous teeth, these primary choppers start falling out about the age of 4 months. Expect lots of chewing and some teething pains when this process starts. By time your puppy is 8 weeks old, he should have all of his baby teeth. That's a total of 28 in all, considerably fewer than the adult teeth. Deciduous teeth don't include molars. These baby, or milk teeth, are longer and thinner than the adult variety. While you might find the baby teeth as they fall, it's more likely that your puppy will swallow them. If you bring your puppy home between the ages of 8 and 12 weeks, start getting him used to daily tooth brushing. It's important for his future dental health; starting early makes it a normal part of his routine. You vet can advise you on the best canine toothpaste to use. The first adult teeth to come in are the central incisors, followed by the fangs -- formally known as canines. Next to erupt are the premolars and molars. When the process is completed, a dog has six incisors and two canine teeth in the lower jaw and the same amount in the upper jaw. He'll have four premolars on both sides of his lower and upper jaw, and six molars in the lower jaw and four in the upper. By the time a puppy reaches the age of 6 months, all of his 42 adult teeth should have erupted. While he's teething, expect lots of drooling and possibly eating difficulties from mouth pain. Avoid giving your puppy old shoes or similar items to chew on. He can't tell the difference between a worn out, useless shoe and your best pair. There are lots of chew toys on the market for puppies, made of natural and man-made materials. 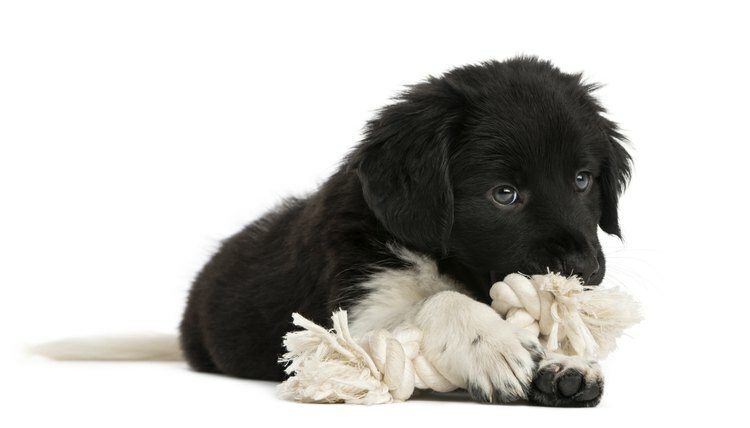 Ask your vet for a recommendation for the best chew toy for your pet. Whatever you choose, make sure it's not something he can choke on or swallow whole. Sometimes, a baby tooth doesn't fall out, and the adult tooth grows in beside it. Known as a retained tooth, this occurs most often in small breed dogs or the short nosed, brachycephalic breeds. The latter includes bulldogs and pugs. Because the baby tooth hasn't fallen out, the adult tooth comes in at an odd angle or position. The condition usually involves the incisors or the lower and upper canine teeth. If the baby tooth isn't removed by your vet, your dog can end up with an abnormal bite, and is at higher risk for tooth decay and periodontal disease. If done early, getting rid of the retained tooth allows the adult tooth to grow in normally.